Speeding in a Work Zone New York | VTL 1180f - Rosenblum Law Firm P.C. What Is The Cost of A New York Speeding in a Work Zone Ticket? Fines: A New York speeding in a work zone ticket costs between $90 and $600. Specifically, it costs $90-$150 for going 1 mph to 10 mph over the limit; $180-$300 for going 11 mph to 30 mph over; and $360-$600 for going 31+ mph over. The minimum fine is double that of a standard speeding ticket. Surcharges: A mandatory state surcharge of $88 or $93 (depending on whether the driver was in a city or a town/village) is assessed on top of every New York speeding in a work zone ticket. This is in addition to the fine. Points: A conviction for speeding 1 to 10 mph over the limit in a work zone will result in 3 points on one’s license. The DMV will assess 4 points for speeding 11 to 20 mph over the limit in a work zone. Drivers will receive 6 points for speeding 21 to 30 mph over the limit in a work zone; 8 points are assessed for speeding 31 to 40 mph over the limit in a work zone; and speeding 41 mph or more over the limit in a work zone will result in 11 points (and likely a suspended license). Auto insurance premium increases: Drivers with a speeding in a work zone conviction on their driving record can see their insurance premiums increase. Several studies have found that just one traffic ticket can lead to up to a 30 percent increase in a driver’s auto insurance rates. Suspended License for Second Offense: Two convictions for speeding in a work zone in New York within 18 months of each other can result in a revoked license. In the typical work zone, the speed limit is lower than that of the surrounding area. The reason for this is that by lowering the speed limit it allows drivers to be more cautious and hopefully avoid hitting construction workers and their vehicles. However, what this also means is that drivers can be caught off guard when the speed limit drops and end up entering the work zone at a much higher rate of speed than the law allows. For example, going 76 mph in a 65mph zone (11 miles per hour over the speed limit) isn’t normally a huge deal and won’t usually lead to a speeding ticket; and if it does the maximum penalty is 4 points and $393. However, in a work zone in which the speed limit is 55 mph, driving 76 mph is 21 miles per hour over the speed limit, a 6 point [work zone] speeding ticket which carries a maximum penalty of nearly $700 ($393 + $300 DRA)! Not only is this a more substantial ticket in terms of penalties, but it also for that reason means it’s more likely that a police officer will pull you over for it. This is one reason it’s critical to pay close attention to the road signage and watch out for those lower speed limits that are associated with a work zone. A conviction for speeding in a work zone in New York can cost hundreds if not thousands of dollars thanks to the combination of fines (which can be doubled), surcharges, and insurance increases. This, plus the risk of a revoked license following a second conviction makes hiring a lawyer to get the ticket reduced or dismissed (if possible) a smart move. An attorney can attempt to reduce a speeding in a work zone ticket to a non-work zone speed or non-speeding violation or plead it down to a lesser-point ticket such as imprudent speed (a three-point violation regardless of speed). By getting tickets reduced drivers can mitigate the impact on one’s driving record and auto insurance rates. NYC is the only location which doesn’t permit plea bargain negotiations but all other NY locations do. Hiring an attorney means the driver does not have to go through the hassle associated with fighting a ticket in court. The lawyer can take over the case and do all the work, including appear in court on the driver’s behalf. 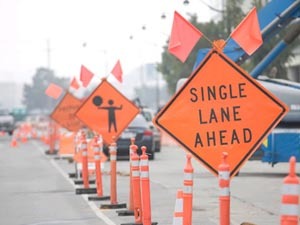 Under NYS VTL 1180(f), a “work zone” (also called a “work area” or “construction zone”) is a location on a roadway that is used or being occupied for roadwork in which workers, vehicles, equipment, materials, supplies, excavations, or other obstructions may be present. It is important to understand that actual construction work does not need to be in progress in order for the area to be considered a work zone. This means that speeding in an unoccupied work zone is just as much a violation of VTL 1180(f) as when construction is in full swing. A work zone is usually marked off by orange barrels or cones and the work zone speed limit sign will also be orange. Remember, New York State law prohibits the speed limit in a work zone from being more than 20 mph under the usually posted limit and it cannot be less than 25 mph. Unlike criminal charges, most traffic infractions carry strict liability. This means that one’s mental state or other situations are not likely to mitigate the charge. For example, a driver who claims he was not aware that it was a work zone (assuming there was posted signage), or admits to speeding in a work zone because he needed to use the restroom or had a personal emergency will usually not find the officer or judge to be sympathetic. That is because, by saying this, the person has fully admitted to committing the violation, putting his/her guilty beyond doubt. As such, these excuses will not hold up in a court of law or in negotiations with a prosecutor. The only way to defend a speeding in a work zone ticket is to make a legal argument as to why the driver’s action was not in violation of the law. This is best accomplished by hiring an experienced traffic ticket attorney who is familiar with the ins and outs of traffic ticket law and has been trained to make legal arguments in court. One common defense that can be raised (when applicable) is that the driver was not given substantial notice of the work zone’s existence. In other words, if there were no cones or signs informing drivers that a stretch of highway has been deemed a “work zone,” he/she may be able to get out of the ticket or have it lowered. This defense will almost always work if there literally was no signage whatsoever and no indication that a rational driver could use to help determine that it was a construction zone (i.e. there were no work vehicles with blinking lights and cones/barrels were not around, etc.). However, it can get trickier if there was a sign, but it was obscured by a tree or if some cones were present but not a lot. Nevertheless, even in this case a attorney will usually be able to help reduce a work zone speeding ticket to a lower offense. Remember, the key to a successful defense against VTL 1180(f) is having an experienced traffic ticket attorney craft the argument and having the appropriate pictures and evidence ready for him or her to use in negotiations with the prosecutor. Drivers licensed outside New York should not make the mistake of thinking they can ignore a New York speeding ticket, especially one for speeding in a work zone. Failing to respond to or pay a work zone speeding ticket can result in a suspension of driving privileges in New York. In certain situations the driver can also found guilty be default. Unfortunately, paying a New York speeding ticket means admitting guilt and accepting a conviction as well as the points, fines and potential for auto insurance increases. New York is also likely to inform the home state of a driver of any convictions, which means those convictions are almost assured to end up on a person’s driving record. Do work zone tickets have a greater impact on premiums than regular speeding tickets? While we have no specific data on this, it is very likely that a work zone speeding ticket will have a greater impact on one’s insurance rates than a traditional speeding ticket. After all, insurance companies raise rates in response to the risk associated with a given traffic violation. Speeding in a work zone carries all the same risk as speeding, plus the additional the risk of injuring workers and/or damaging equipment. The insurance carrier may see a driver who commits this violation as having less than ideal presence of mind, a habit that could result in an accident later on and raise their premiums due to perception of increased risk of a claim. What if there are no workers present in the construction zone? The presence of construction workers is not required for a driver to be ticketed with speeding in a work zone. The only requirement is that the driver be passing an area clearly marked for construction and exceeding the zone-specific limit (which can be up to 20 mph below the usual limit for that stretch of road). Can I undo a guilty plea for a speeding in a work zone ticket? Many drivers do not realize that it only takes two convictions for speeding in a work zone in 18 months to lose one’s license. Drivers who have made the mistake of paying a second ticket can attempt to reverse the plea by filing a Motion to Vacate. Also known as a “Coram Nobis” motion, this formal request asks the judge to undo the conviction, which then allows the driver to contest the ticket in court. Drivers who wish to try this should consult with an attorney first. Does it matter that other drivers were speeding in the work zone too? No. The fact that a driver was going with the “speed of traffic” is not a defense if that speed is above the speed limit. This may seem unfair since other drivers should have been ticketed too. However, in the eyes of the law all that matters is whether or not the ticketed driver was breaking the law and not whether others were doing the same. The speed limit in any given work zone can vary. New York State law requires that a work zone limit be no more than 20 mph below the standard limit for that stretch of road, and that the minimum allowable limit for a work zone speed is 25 mph. Police in New York State issued nearly 7,000 tickets for speeding in a work zone in 2016, the most recent year for which data was available. The most tickets were issued in Erie County, which handed out more than 1,000 tickets that year. Other Canadian-border counties, such as Jefferson and Clinton Counties, were also in the Top 10. None of New York City’s five boroughs individually ranked in the Top 10, but combined a total of 322 work zone speeding tickets were issued in NYC. Approximately two-thirds (214) were written in Staten Island.